Casio has created a very nice compact long-zoom digicam. The Exilim EX-H5 has a lot to offer, including a nice wide 10x optical zoom, sensor-shift IS system, 12-megapixels, some nice Burst mode options, and a Li-ion power source for only $179 US or less. Read more in our Full Conclusion. Answering the call to provide consumers with an affordable compact camera that still packs a punch, Casio has created their Exilim EX-H5. This inexpensive digicam boasts some appealing features for a camera of its size, including 12-megapixels, a 10x optical zoom lens with wide 24-240mm equivalent zoom range, 720p HD video recording, and a plethora of useful exposure modes. The EX-H5 was designed with ease of use in mind, with minimal controls for less complicated operations as well as fully automatic exposure control so you can keep your eye on the subject, and not the camera settings. 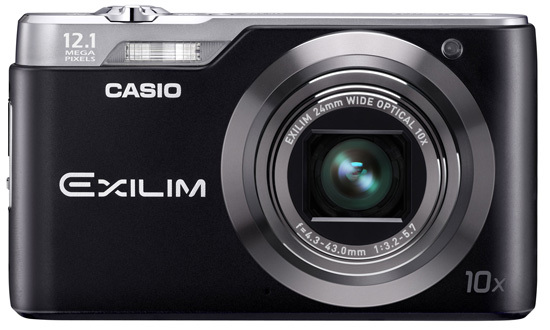 The Casio Exilim EX-H5 is available now with an MSRP of $179.99 US.